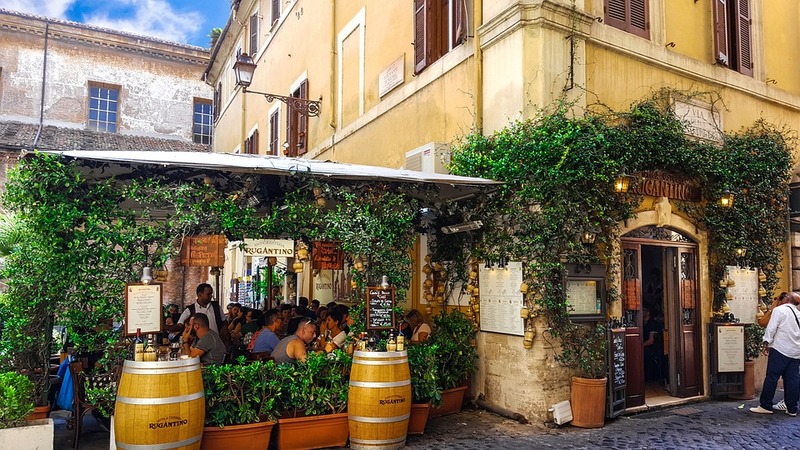 Rome is such a large and touristy city, that it can be difficult to decipher between the good and the bad Rome restaurants, as there are so many to choose from. We intend to provide you with the latest, up-to-date list on the best restaurants in Rome. Finding a restaurant Rome can be a bit overwhelming; a new city, a new language and so many choices. But, eating in Rome is a great thing and we’ve made it easy for you to decide. Eating out in Rome is full of endless possibilities which include all types of cuisines, not just Italian. Most visitors traveling to Rome wonder “what is the most famous food in Rome?” Any local living here would say that the food you need to try in Rome is pasta, for starters. Rome is famous for different types of pasta dishes, including one of their most famous, cacio e pepe. Cacio e pepe can be found in such top restaurants in Rome as Trattoria da Cesare and Osteria da Zi Umberto. Among other Roman pasta dishes, you will also find carbonara and amatriciana. Carciofi alla Giudia- Jewish style fried artichokes. Found in, but not limited to, the Jewish Ghetto in Rome at such restaurants as Nonna Betta. Carciofi alla Romana- stewed with garlic, parsley and mint. Vignarola- An artichoke stew with fava beans and peas. Grazia & Graziella– traditional Italian food and decor straight out of the 60’s and 70’s. Antica Trattoria da Carlone – classic pasta dishes served in large portions with live music. Cencio La Parolaccia – come here for good food and an even better time! On the go and on a budget? Don’t worry. There are plenty of cheap restaurants in Rome that are equally as delicious as the pricier ones. C’e Pasta…e Pasta – serving Roman Jewish classics – sit or takeaway. Panificio Bonci – close to the Vatican, you’ll find breads, cookies and pastries here. Trappizzino – sandwiches and wine. Simplicity at its finest. Supplizio– supplying you with another one of Rome’s must try foods: Suppli. Velavevodetto – one of the best local restaurant in Rome – here you will find a restaurant full of locals. Imago– 1 star – contemporary Italian cuisine with a panoramic view of Rome. La Pergola– 3 stars – located inside a Roman 5 star hotel, this restaurant is not only one of Italy’s best restaurants, but often noted as one of the best restaurants in the world. For our movie buffs, you’ll want to switch things up a bit and head over to the Movie Restaurant Rome. Part museum and part restaurant – displaying and serving all things movies. Check out their website for information on the restaurant itself, and the deal they provide with all UCI Cinema locations. Hang Zhou – considered the most famous Chinese restaurant in Rome, run by a woman named Sonia, who has become equally as famous. Kiko Sushi Bar – Here you’ll find fresh and delicious sushi by sushi chef Atsufumi Kikuchi. Ba’Ghetto – the oldest Jewish restaurant in Rome serving Kosher, Italian and Middle Eastern dishes. We hope you find these restaurants well and enjoy every last bite.